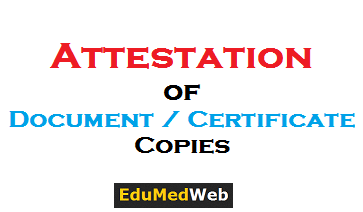 Attestation Of Document/Certificate Copies Means That, On The Photocopy Of Document /Certificate There Should Be A Sign Of A Class I Gazetted Officer Or A Notary Official With Their Clear Official Seal & Signature. Attesed Documents State That The Photocopies Are Verified & Are True Copies Of The Original Documents /Certificates. Gazetted Officer: An Officer Or Public Servant, Who Is Appointed Under The Seal Of The Governor Of The Concerned State Or By The President Of India At National Level, Requires Being Listed In The Indian Gazette Or State Government Gazette To Be Considered A Gazetted Officer.